The Jordache Women's Pull-On Denim Jegging featuring an elastic waistband makes it different from other jeans. With the look of form-fitted, polished denim but the cozy feel of stretchy fabric and a pull-on waistband, this style is essential for that casual chic look. This comfortable cotton, polyester, and spandex combination can be a staple of your wardrobe. The fabric blend has extra stretch and holds its shape. This skinny jegging has a super slim leg for a long and lean look. Pair these versatile bottoms with your choice of casual tops to create many looks. This women's jegging by Jordache will make a solid addition to your wardrobe. I was looking for jeggings that were not so tight you can see the outline of my knee and calf. These are perfect. I am usually a size 6. I got the size 8 which fits great but at end of day i do tug them up. A size 6 would not have worked, so I am fine with it. Would recommend. I am 5'7 and they were perfect length. I have very skinny legs, so even super sinny jeans are too wide for me. Thak you, Walmart, for these jeggigs, The iit well all over and they make my legs looks great. Better still mthey come in petite sizes and tje medium wash is the perfect for me . Im sure that I can wear them year-round and I will be buying them in colors. They are very comfortable and well-made. I purchased these jeggings based on the reviews of others. So glad I did. They are thicker than I thought they would be. They are well made, nicely stitched with a wide, sturdy waistband. I am 5' 7" and normally wear a 12 or 14 so I bought a 14 and they fit nicely and are plenty long. I purchased three colors and love them all. I have been wearing them to work with boots and long sweaters and they look classy. So happy with this purchase. Good fit and length. Comfortable. I don't like skinney jeans usually and these are the only ones I've tried and liked so far. Super soft. And washed well. Only issue I noticed is the sizing isn't uniform. I bought 1 pair in the dark denim and loved them so immediately ordered 2 more, another in the dark rinse and a lighter rinse. The lighter color fits much tighter but not a deal breaker. I love the cut of these jeggings. They are very soft, fit well and are very comfortable. I like them so much I ordered them in 3 different colors! The only tip I would give is to order a size up if you are a woman with hips. Typical of Jordache, they run small in the hip area. Everything about this pair of Jegging is great with one exception, thus the 4-star instead of 5. I wish they were high-rise, i.e. 10 or 11-inch rise, so that they would hold in your belly to make you look slim. Most people may not care much about the rise, this style offers 9-inch, but I do. This review all pies to all colors offered in this style, which I bought 3. The fit is good, but where it has been "faded out" on front of upper leg has what I would describe as a very visible big scratch across it. I know it is not a stain, but it sure looks like one to anyone else who sees it. I'm going to return or at least try to exchange it and see if the new pair is flaw-free. I can not believe that Walmart sent me a DAMAGED pair of jegging! I had a trip coming up and I decided to buy these at the last min. BIG MISTAKE! There is a rip/hole in the back of the jeans and it's VERY obvious that the person who packed this item saw it. 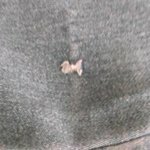 Will not purchase online clothes from Wal Mart again.